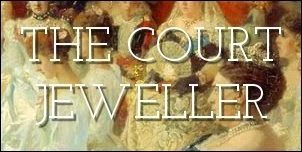 Love the glittering jewels of the Dutch royal family? You're in luck -- the Royal Collection launched a brand-new website yesterday that includes information about and high-res photos of some of their bejeweled treasures. One of the most interesting objects in the online gallery is the delicate tortoiseshell fan from the Mellerio Ruby Parure, the set of jewels worn above by Queen Emma (and also above by Queen Maxima). The fan, made in 1888, is set with diamonds and rubies. Another intriguing item in the online catalogue is a pair of bracelets made in 1822 for King Willem II and his wife, Anna Pavlovna. They were a gift to Queen Wilhelmina from Grand Duke Adolph Friedrich of Mecklenburg-Schwerin on the occasion of Queen Juliana's christening in 1909. One features Willem's name, and the other includes Anna's -- and both of them are made of gold, turquoise, and (in a common nineteenth-century practice) braided hair.